Let's be honest, applique is fun, fun, fun. How would you like to do something unique for this spooky holiday season? 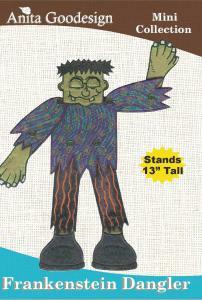 The Frankenstein Dangler is the answer, Frankenstein stands well over a foot tall & he can be dressed up with any kind of fun fabrics that you would like to use. He assembles very simply using buttons and all of the pieces can fit in a 5"x7" hoop.